What is Hybrid DIMM Memory Module ? Micron Technology Inc. plans to add NAND flash along with DDR4 DRAM chips on standard DIMM memory modules. Micron said it believes Microsoft will support the so-called Hybrid DIMMs that could pack up to 256 Gbytes of memory. The Hybrid DDR4 DIMMs will likely offer greater performance with memory access times measured in nano- rather than microseconds. Jedec have recently adding 4 extra pins to the Jedec 284pin DDR4 DIMM module PCB board to include 4 extra 12Volt pins neccessary for Hybrid DIMM application. The 12V is neccessary for powering up the Nand Flah devices. The new DDR4 DIMM PCB will be 288pin instead of 284pin. The DDR4 256 pin SODIMM pin-out will remain unchanged. OEMs manufacturers have been approaching Micron with applications for hybrid DIMMs including in-memory databases and more. Micron believes the modules will be used as faster SSDs with large DRAM caches, DRAM modules with flash as swap space or as flash block storage assisted by DRAM.The hybrid DIMMs use a special controller as the main interface to the processor. They also have a separate flash controller. Micron will enable hybrid DIMMs under Linux Operating system and It expects to roll out that Linux software in time with DDR4 products. Micron reports that they are already sampling non-volatile DIMMs. 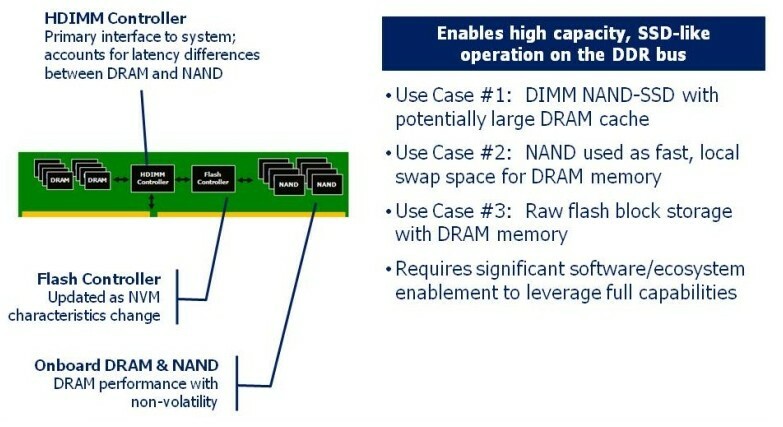 NVDIMM uses Nand flash and an capacitors to back up DRAM in the event of a power failure. Micron plans to have versions of its Hybrid Memory Cube (HMC), a 3-D memory and logic stack, suitable for integration in partner ASICs and FPGAs.